While the question of the status of the British Football Associations as four different members of FIFA and UEFA sometimes get raised, it seems to be forgotten that there are other analogies, other FIFA members that are not states in their own right. The Faroe Islands, does at least have a level of independence from Denmark, but then so does Greenland, who appear unlikely to be allowed to join in the near future. French territories such as New Caledonia are also member states of FIFA, (while Monaco is not, afraid of jeopardising AS Monaco’s position in the French League). In the far East, the return of Hong Kong and Macau to Chinese control did not mean the disbanding of their own national football associations, or their removal from FIFA’s lists. Of course, there are differences, in particular, the Faroe Islands, New Caledonia, Hong Kong and Macau all have their own leagues and no representation in the mainland’s league, (New Caledonia does have representation in the French Cup), while Wales has clubs in the English system. And so to Puerto Rico. 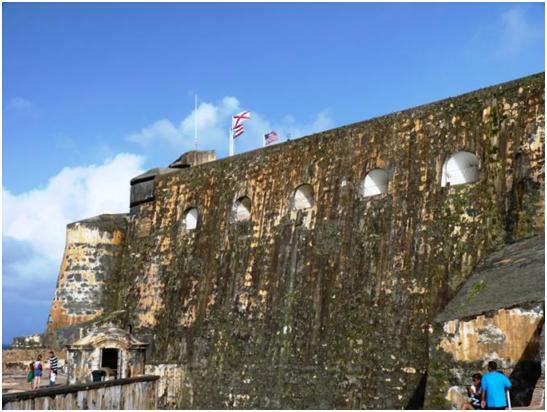 The one thing that is clear is the status of Puerto Rico  anyone in the US or Puerto Rico seems to know this  it is an unincorporated organised territory of the United States. It is not alone in this  Guam, the US Virgin Islands and North Mariana Islands have the same status. Puerto Rico, Guam and the US Virgin Islands are all members of FIFA. The North Mariana Islands are associate members of the Asian Football Confederation, meaning they may join FIFA at some time in the future. 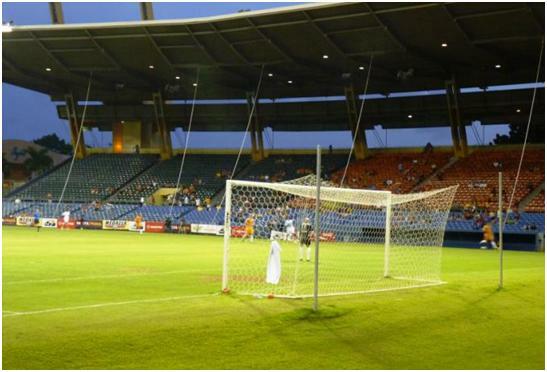 Puerto Rico has both a national league of its own and a team at the second level of the US Football system. A little history and politics before we get back to Football. Puerto Rico is part of the lesser Antilles islands. Its nearest neighbours are the Dominican Republic to the west, and the Virgin Islands, (US and British) to the East. 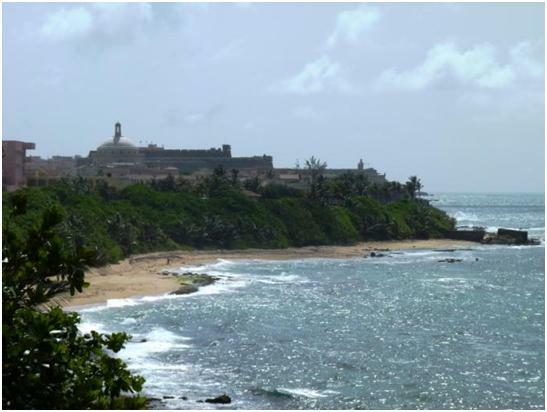 Columbus landed in 1493 on his second voyage, naming the island San Juan (after Saint John the Baptist) and the main town Puerto Rico (or Rich Port). 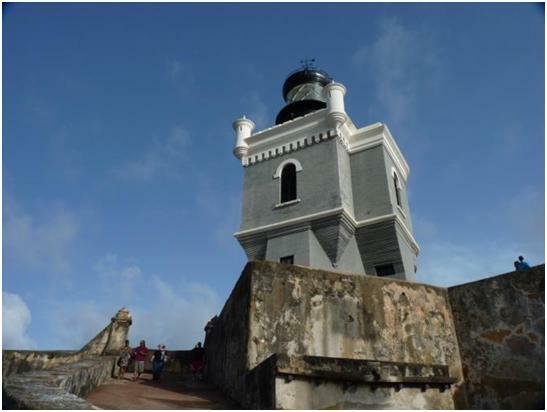 At some time these names were switched, and the town of San Juan is now the capital of Puerto Rico. The Spanish colonised the Island, enslaving the local population and sacking its riches, although for most of the time, they were only interested in the ports, and left the interior untouched. The lack of immunity to European diseases, and the effects of slavery killed off most of the local population, and hence the only remnants of the indigenous population (known as the Taino) is through the gene pool. Spanish immigration, along with slaves brought in from Africa is the basis of the current population. The racial make-up of the population appeared to me to be very mixed  with the addition of recent immigration from across Latin America, while there has been sizable emigration to the USA, as all legal citizens are citizens of the US, and hence have free movement to and from the mainland. Spanish is the main spoken language, and the level of English spoken is surprisingly poor, even among those working in the tourism industry, despite the fact that the main source of this tourism is mainland USA. 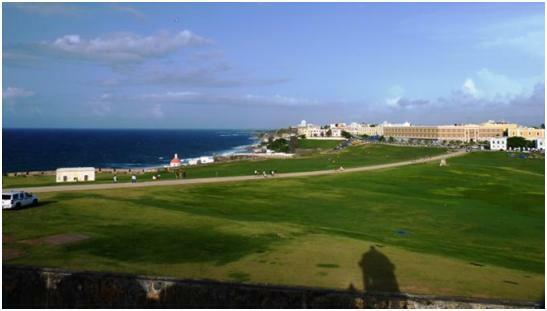 Since becoming a Spanish Colony in 1493, the island was eyed up by other colonial powers, particularly the British and Dutch. 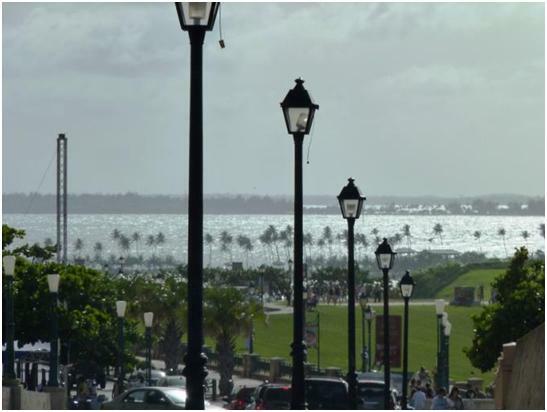 This has led to heavy fortification of the port of San Juan. The British attacked in 1595 (unsuccessful) and again in 1598 (successful  although the British forces went down with dysentery, and had to abandon the Island back to the Spanish after only 10 weeks). Further attacks by the Dutch, British failed, but the Americans did win their 1898 war against Spain, and the territory, along with Cuba, Guam and the Philippines were all ceded to the USA at the treaty that followed  giving the USA an instant empire of its own. The current political situation on the Island is something of a stalemate, with the main political groups being those in favour of the current situation, and those who would like Puerto Rico to become the 51st state. If this were to happen, then with around 4 million people, it would be around mid-table of the list of states by population, but above only Delaware and Rhode Island in terms of area. To use the most common form of land mass comparison, Puerto Rico is half the size of Wales, has 33% more population, and a hell of a lot more motorways. There is an independence party on the island, but they have little influence at the ballot box; however, there does appear to be a movement to remember the pre-colonial island, with a number of books on Taino culture and even a Taino-Spanish dictionary on offer! It appears the general population knows from where their bread is buttered. To citizens of the US, this is Caribbean lite, a chance to go abroad without the complications of changing currency, or missing their favourite TV programmes, and thanks to the boys at BP, tourism should be up this year, while the Gulf of Mexico coast suffers from the consequences of paying less than US$1 per litre of petrol. Meanwhile the strangest consequence of Puerto Rico’s political situation, is that the locals can register as Democrats or Republicans and have a say in who the presidential candidates are  but they do not get to vote in the Presidential election itself. They also have no voting representation on Capitol Hill. Four million American citizens with taxation but no representation. One local told me that he did not think that the locals should have supported Spain in the World Cup, given the history of the Spanish exploiting the “Rich Port”, and taking away the riches. The majority did not appear to agree and generally, the local support was for Spain. Of course, more of the locals are descended from Spanish settlers than any other group and from what I could discover, the riches that the Spanish plundered and moved through Puerto Rico were more from other Latin American countries than from Puerto Rico itself. Still, there is a difference in that these descendents of the Spanish will show an allegiance to Spain, (once their more local allegiances have not worked out). Would an Australian, New Zealander or Canadian support England in the World Cup final? Getting to Puerto Rico was more straight forward than I may have hoped for, considering that matches in the US and Canada do not kick off on time  the best you can do is for the national anthem(s) to be played at the stated kick off times. The worst was Montreal, where the match notes stated (quite accurately) that kick off was 7.47, as opposed to the official 7.30, and then the second half started 68 minutes later, (in most games I went to, the halves kicked off around 62 or 63 minutes apart, which I have found to be the general standard in England and Europe as well). Portland finished around 9.00, and I reached the airport by 9.30 giving time to check on for a 10.20 flight. Over 8 hours flying, 100 minutes changing planes and three time zones meant I arrived at Puerto Rico around midday, but still had to hang around in the hotel bar waiting for the room to be ready. Still, I was in place to see the World Cup final on TV, although after the journey, I lacked the will to watch it outside with the locals, and settled for my comfortable (air-conditioned) hotel room. I used the overpriced taxi service to get to the Stadium. Taxis in Puerto Rico have a perfectly reasonable fare structure printed on the side, but all refuse to use this structure. I have been told (by a taxi driver) that they use a zonal system in tourist areas  he even produced a table to show how it works, except he did not reckon with me being able to read English, and realise that the fares printed were not the same as he wanted to charge (in fact, the official table says zones are only used to and from the airport, meaning I was only overcharged by $2 between airport and hotel). Anyway, the stadium is well outside the tourist areas. There is a metro with a station next to the stadium, but no station in the main city or the tourist resorts. Asking about taxis with locals, the response was always, “I don’t know, I never use them!”. When I arrived at the Stadium, it was practically deserted, making me wonder if I had the wrong date, or at least kick off time  but the gates were open, and I was admitted, and the fixture was as printed. The stadium was another that is shared with baseball, and this results in an impressive stand curved around two sides of the ground only, while no spectator accommodation at all on the other two sides. The pitch was grassed, but was clearly not well looked after. In one goalmouth, there was a diamond shape of bare earth, and my assumption is this would be third base, the other bases were thinly grassed over, as was the plate area  which anyway was just off the playing surface by the corner flag. At Portland, I was told the pitcher’s mound was portable, and was moved from the sideline in one piece, I assume something similar happens here, as no mound was visible. Of course, there were factors to keep the crowd down  the World Cup final on TV earlier in the day may well have distracted potential viewers, and a double weekend, with matches on both Friday and Sunday  but anyway I was given the impression that crowds for the Islanders are not as high as the other USSF division 2 clubs I had visited. The official figure for the match was 1089 (less than halve the figure that had seen the Friday match). A lot of the crowd appeared to be on the young side, and they did manage to make quite a noise despite being spread out around the ground. Thunder crackers were being given away free, as often appears to be the case in Britain, while a few vuvuzelas could be heard. I fear a sign of things to come  in small numbers, these do not produce the continuous buzz we are now familiar with from World Cup games on TV, but a plaintive wail. It is about time I discussed the current situation for Football in the USA. The main league is the MLS, (Major League Soccer) with 16 current teams. They play 30 matches, which means the standard format of playing every team home and away. However, the league table is split into two, the Eastern and Western Conferences with the top two of each Conference guaranteed a place in the eight team end of season play offs. As a rule, this means that the top eight in the combined table will make up the play off teams. 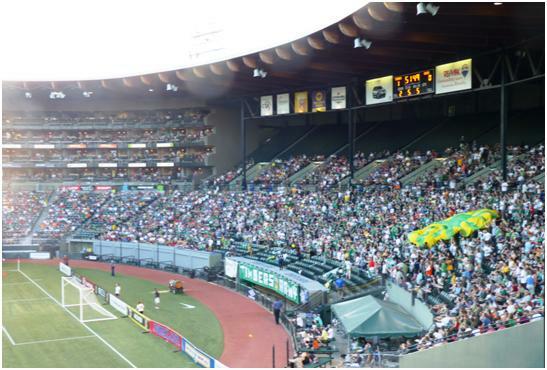 The league is franchised, rather than direct promotion and relegation, so it is already known that two new teams (Vancouver and Portland) will enter for 2011, and one more (Montreal) in 2012. There are plenty more potential franchises in the offing. Up to last season, the second division was the United Soccer League’s division one. However, over the last year, there has been a dispute between the teams, mainly over the league’s ownership. Six teams were going to leave the division and reform under the title North American Soccer League, (which was also the name of the main league when I first visited in 1994). The two leagues then sued each other, which is of course a national pastime in the USA, but this one went to the governing body, the United States Soccer Federation, (USSF), which decided to curse both houses and run the league, (for one season only, officially) themselves. This is under the title USSF, Division 2  but on the USL web site, you access it as Division One. The USL itself has two further divisions, as well as running a Women’s league. The USL division 2 is a six team league, and the only level 3 league in the USA, while the PDL (for Premier Development League) is a widespread level four league, with four regional conference, each divided into two more regionalised divisions. 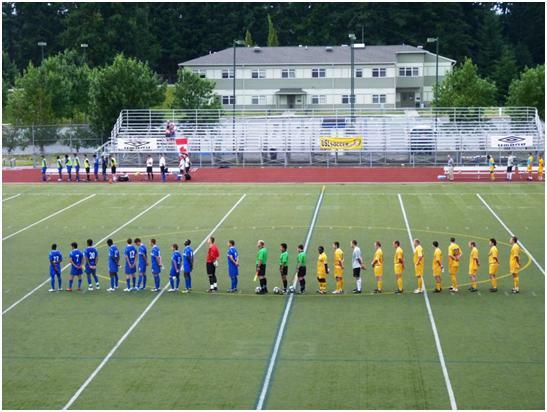 All of the PDL teams play a 16 match regular season, but division sizes are not always 9 teams, so in some there are more than two matches against selected teams, whereas others have a couple of opponents they play once only, (9 teams is the most popular division size though). There are special arrangements in the PDL for Bermuda Hogges  who only play four opponents at home  each of their visitors play twice on the islands, generally Friday and Sunday of a weekend. 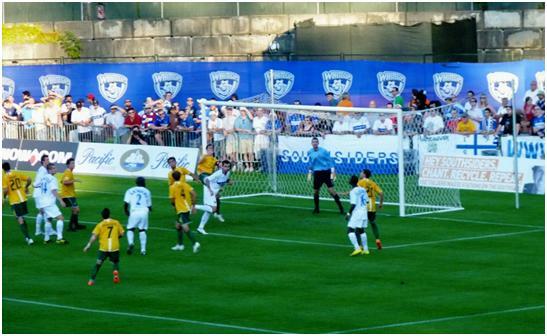 When Bermuda travel to the mainland, they also play two matches on a weekend, although generally at different locations. In the USSF Division 2, the 12 teams play 30 matches, which means they play every team at least twice, and four selected teams on four occasions. Two of Puerto Rico’s opponents play twice in a weekend on the Island, but Carolina visit the Island twice, in May and July. The league is arranged in two Conferences, but unusually they are not geographic, and depend on whether a team was going to stay with the USL, or become part of the NASL. 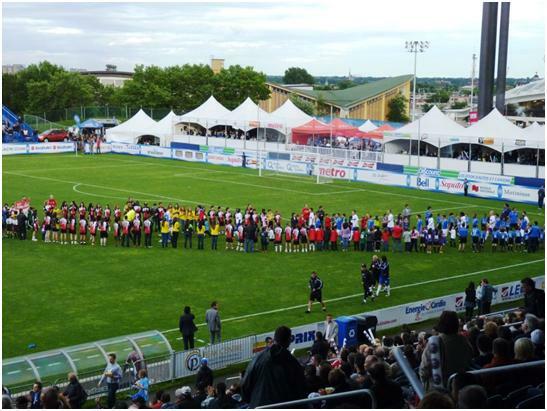 The groupings for playing teams twice however are regional, with four groups of four, plus every team players on other team a third and fourth team, (allowing the all Canada match, Montreal and Vancouver to take place four times, which may be over the top, as they also play twice in the Canadian Championship). Only the top team in each Conference is guaranteed a place in the eight team play offs, which does not make sense, as if eight out of 12 go through, then fairly clearly a minimum of two must go through from each Conference, and the combined table is going to decide the make-up of the play offs. And so, the game itself. Both teams played with a single forward, and the opening exchanges seemed frenetic, fast and not well organised, the play was not helped by the playing surface. Carolina took the lead with two early goals, the first when Sullieu Bundu broke through the defence at put the ball past the keeper on 18 minutes, and then eight minutes later when the home side failed to clear their lines, allowing Josh Gardner a shot that went in through a crowded area and into the net. After the second goal, the Islanders re-arranged their team, bringing on a second forward and in simple terms, they overran Carolina for the last sixty minutes of the game. The statistics sheets bear this out  Puerto Rico are recorded as having 16 shots, to their opponents 6, and to have been ahead in this category 10-1 after half time, they also led 10-1 on corners. The official page does not record how many of the shots were on target, but does state that the Carolina goalkeeper made five saves, while the home keeper made only one (and of course, failed to save two more). In the end, the only statistic that matters is that those two early Carolina goals were the only goals of the game. According to the stats sheet, the Islanders goalkeeper made one save. Guess this is it! When I went into the office after the match to pick up the stats sheet, I got to see the Puerto Rico coach, Colin Clarke and his assistant Adrian Whitbread. Clarke appeared very busy trying to load up a video of the match on his computer as a way of finding out what had gone wrong, but Whitbread had time for a quick chat. Naturally, as I support Cheltenham where his old boss, Martin Allen had been manager until recently, we talked a bit about Cheltenham and Martin Allen first. It is always nice to meet someone this far from home who has heard of Cheltenham Town. The Clarke/Whitbread team is in charge not only of the Islanders, but also of the Island’s international team. Generally, this has not been a burden as they have not played since being knocked out of the World Cup by Honduras back in 2008. However, the status of the club gives them more matches than most USSF teams. Back in the spring, they played in the Caribbean Football Union championships and actually won the tournament. A top three position in the CFU championships gives a team a place in the qualifying round of the CONCACAF Champions League, and the Islanders are due to visit Los Angeles for the first leg of their two legged contest at the end of the month. After that has been played, the National team will be taking part in a three match series in the first round group stage of the Copa Caribe, (the national team competition in the Caribbean). As they are staging these matches in Puerto Rico, the home side has every chance of going through, although they will not be expected to reach the final stage, let alone qualify for the CONCACAF Gold Cup in 2011. Looking at the team from the last World Cup, very few of the International team play Islanders League squad, some are with Universities on the mainland, and quite a few are with the clubs in the Puerto Rican league. Only one appears to be in the MLS  Terry Boss, a goalkeeper at Seattle Sounders. 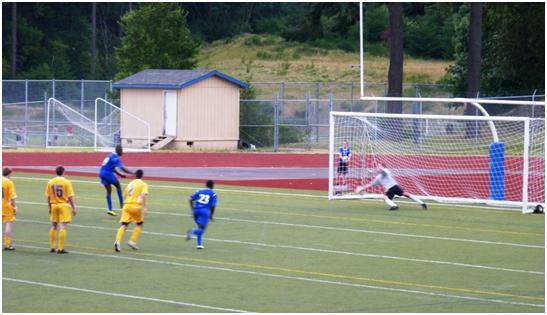 Boss is not the regular keeper for League matches, but did turn out in their US Open Cup game. I will be observing the squad list for the August games, to see if the club has managed to recruit more of the international squad. Whitbread told me that the Islanders do not have difficulty in recruiting players, as Clarke has excellent contacts with scouts on the mainland; he also seemed to think more of the squad would play for the International team next time around, as those coming from mainland USA are already USA citizens, (there not being a separate category called Puerto Rico citizens), and they can therefore qualify to play internationally after a two year residency period. I’m not certain if FIFA have anything to say about this, but I know they have started to insist on a five year residency by players taking out a change of nationality to play for their adopted countries, after several high profile cases especially in countries such as Qatar. The difference here is that no change in nationality takes place. There is also a large pool of US citizens qualified to play for Puerto Rico under the parent and grandparent rules, whose forebears have left the Island. Of course, this argument works both ways, anyone who is born on Puerto Rico, but who then leaves for a mainland university is qualified as a potential USA international by the time he has finished his course! I did my tourism bit in PR, the day after the match spending the afternoon in the old city of San Juan, and looking around one of the forts used to defend the territory against various aggressors. It is an interesting place, and quite a contrast to the modernity of most American cities. The Island also has a good selection of beaches, and I would imagine some fine scenery had I taken a car  public transportation is poor, and there are not many tours on offer. From my hotel to the town it was about an hour’s walk. Despite heat and humidity, this was not a major problem. I had to cross a bridge over an inlet that brings the sea behind the peninsular the hotel was on, and one of the locals jumped into the sea at me. I was somewhat surprised that the water was deep enough to take someone jumping from about 20 feet, but he made a bit of a splash. It was the closest to an aggressive act I witnessed during the whole tour. 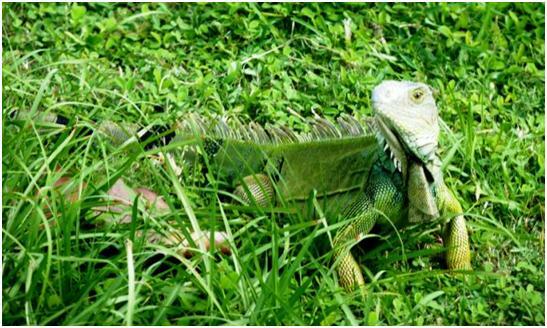 Further along, where there was a grass verge, some green lizards, (Iguana, I think) paused in their sunbathing to observe the unusual site that is a pedestrian in these parts. It is still, as I have already suggested, “Caribbean Lite”, for Americans, it is over-priced for taxis and hotels, and I would not recommend it to vacationers. 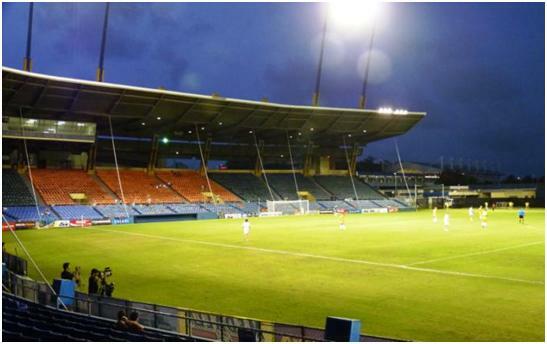 For me, it adds one to the list of countries visited for football, the only extra one available to me at this time, but before I will really start to say I have been to the Caribbean, I need to go to at least one Island with a Test Venue for cricket! Rumour has it that the French and the Netherlands also colonised some of the area, and they play neither cricket, nor baseball. Following my Tuesday night baseball game, I started Wednesday in the same city as I intended to finish it. A rare luxury indeed. My priorities for the morning were the World Cup semi-final, and some laundry. The recommendation from the night before had been Fremont  for the football  but it turned out to be good for both, as while looking for a place to park near the pub, I actually spotted a launderette, and with an adjacent parking place. Fremont is more like a European suburban town centre than anywhere else on this trip as it has shops, offices, bars (and a launderette) in a line down the main street, and a shortage of parking spaces. People were actually walking from home or office to whichever shops they needed to visit. With my clothes safely ensconced in a machine, I followed the suggestion and went to watch the football at the George and Dragon, a “British” pub. Not that I could get in, the place was heaving and no room was available inside. Still I joined with a 100 or more others watching from the courtyard in the open air. Beer was of course available, and was good. Nothing I like better on a hot day than a good Hefeweizen, and despite the fact that Seattle is a long way from Germany, the beer (locally brewed) hit the mark. It was rather hot in the courtyard, so after switching my clothing to a dryer during the half time interval, I choose another bar for the second half. Not quite so crowded, and room to have a bite to eat as well as seeing the game, (diet coke now in preparation to drive later). After the game, my clothes needed more time in the dryer, so I went to the coffee shop next to the laundry. It was here that I almost had a disaster. When I put things back into the car, and tried to re-arrange my luggage, I managed to shut the car boot, (or trunk as they call it) with the keys inside. This is where I discovered how much better Americans are at service than Europeans. The café operators found the number of the car hire company, and lent me their phone. I ordered another coffee and stopped to wait for someone to help. Before I had barely drunk a drop, someone had arrived from a company called “Pop-a-lock”  and within minutes, the car door was open. Great service, and smiles the whole time, (but slightly disturbing how quickly the car was broken into). For the Open Cup game, both LA Galaxy and Seattle Sounders selected teams that bore no relation to that for the previous Sunday’s league match. Indeed only three of the starting line up had started in the last match, although all six playing subs now started, and of the 14 on the benches, 11 had started on July 4. Also changed were the colours, with the Sounders picking a particularly bright fluorescent yellow/green, which rather stood out in the bright sunshine. 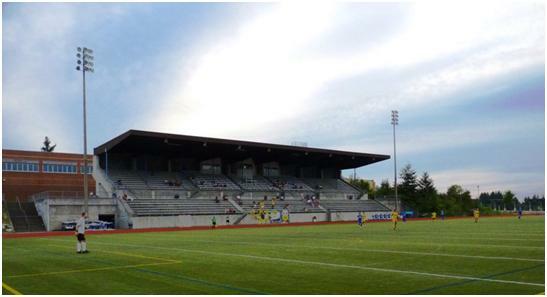 The match was not held in the well appointed and central Qwest Field, but the more homely Starfire Stadium, part of a university complex about 10 miles south of the city. 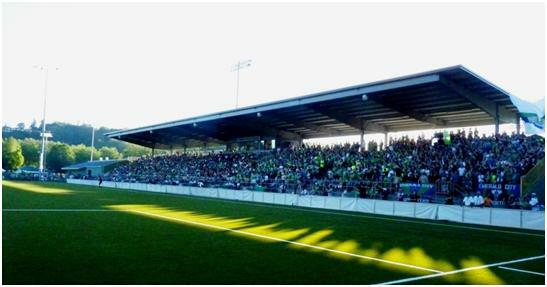 This stadium had been used by the Sounders prior to the building of the new stadium, and the club’s elevation to the MLS. The playing surface is artificial and appeared to be on the narrow side. From time to time, a flume of black beads was thrown up by the bouncing ball, or a player’s footfall . A single tiered and covered stand runs along the length of one side, providing around 15 rows of metal seats. A similar but lower and uncovered construction runs about three quarters of the opposite side, and there are also a few rows of seats for part of the space behind one goal. Standing spectators found vantage places around the rest of the ground, especially on grass banks towards the corners, one of which had a bar set up  there are no laws against beer and football in America. The crowd was given as 4512  suggesting the stadium holds around 5000. The match opened in frenetic fashion, with chances being created at both ends, and the Sounders have some sense of dominance, pinging the ball around within the area, but not managing to get past the defenders and put in a genuine shot. This helped the crowd to generate some noise and atmosphere  and without the need for prompting from the announcer, in contrast to the baseball the previous night. 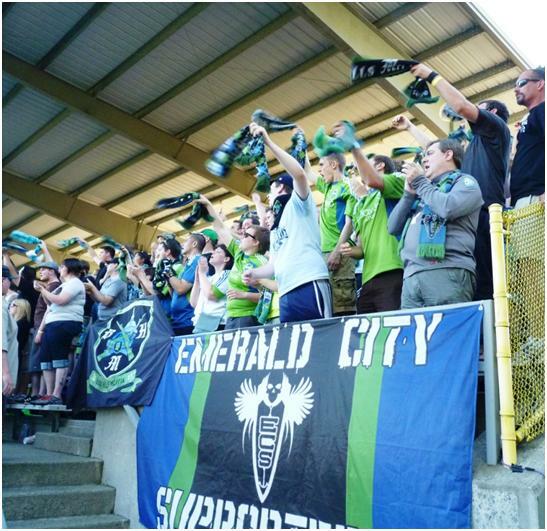 At one end of the main stand, there is a group of supporters, styled as the Emerald City Supporters, who sang throughout the game, aided by a drummer and a German style leader with a megaphone. However this good start should have been nullified when Klein got free on the right in the 19th minute. Alan Gordon, a sub on Sunday managed to scoop his chance and it went over the bar. While Seattle had the most of the possession, it was again the Galaxy that came closest to scoring after 39 minutes. Again the move started with Klein on the right  this time he put in Kirovski, who advanced to a tight angle, and then launched a shot which came off the near post. A typical home chance in the 42nd minute saw both Levesque and Jaqua trying to control a bouncing ball while the goalkeeper faced them but did not himself take the ball, the chance was eventually bundled away. The second half started with Seattle again looking the better side  but this time they managed to get from the ball bouncing in the area, to the ball bouncing into the goal. The ball was advanced, originally down the centre of the field, and then passed to the left from where Montana shot twice, the first effort being saved, the second coming off the bar. Much of the support were calling for a goal, but Jaqua was most alert and headed the bouncing ball into the net. The score was added to on 63 minutes. Again Montana was the man on the left, who delivered a perfect cross to Jaqua, who headed the ball in off the post. A chance for Jaqua to complete his hat trick, was blocked after Zack Scott crossed low from the left. LA Galaxy responded by making their 3 substitutions within a few minutes, while Levesque tried to place a shot past the goalkeeper and failed. A touch by Levesque in the 76th minute played Jaqua through in space, but the goalkeeper was quickly out and foiled another attempt to complete the hat-trick. This was his last chance, as he was taken off with seven to play. The ground is next to the railway line, and every few minutes we could see a train, trundling past one corner of the field. Most of these were freight, but it was noticeable that one passenger train had the word “Sounder” on its side. This was not a reference to the football club itself, but a reflection that both the football club, and the rail service take their names from the Puget Sound, a deep water channel that serves Seattle and gives it such a good position as a port. 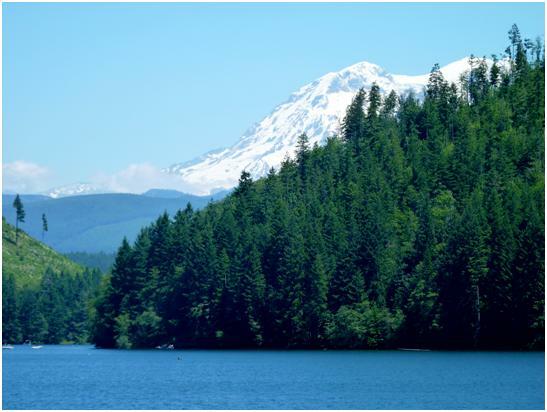 When one drives up and down the road between Portland, Seattle and Vancouver, you are treated with the greenery, mainly forested slopes coming away from the lowlands, and mountain peaks in the distance. Most of the mountains were green, but a small number stood up proudly above the others and had a white cap of snow on the peaks. 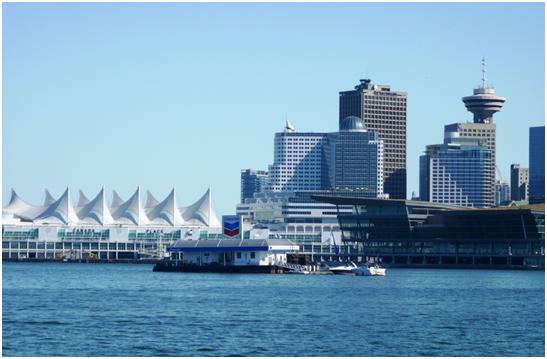 From here, my next port of call was Vancouver  a return to Canada. 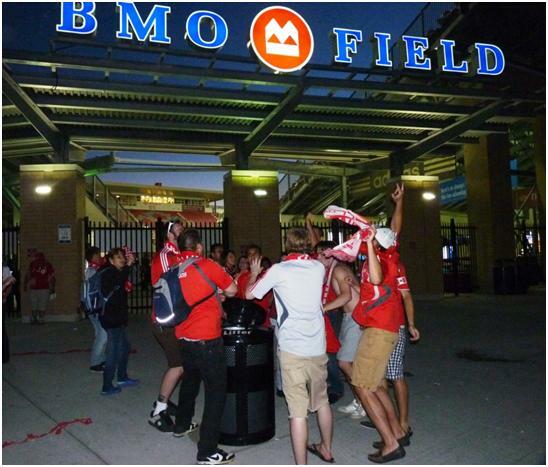 Crossing the border, I was asked why I was going, I said to watch the Whitecaps  the customs official then asked why? He let me through despite the fact I did not give an adequate answer. I went first to the centre of town, where I failed to get into the construction site where BC Place, the eventual home of the Whitecaps in the MLS next season. 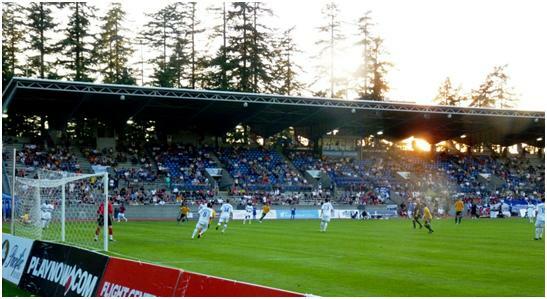 The construction of a new roof will not be done in time for the start of the new season, so they will start the season at the Empire Fields  the stadium used when the Empire and Commonwealth games of 1954 were held in Vancouver. Good to see that neither the Empire Fields, or BC (for British Columbia) Place have yet taken to sponsor’s names. There are plans beyond this, that they may one day have a “soccer-specific” stadium in Vancouver, but the plans seem to be on hold at the moment, with 2013 being the earliest possible date for this venture. Apart from not accessing the stadium, the city is a good place to walk around, with a lively feel, and many pleasant vistas, especially when viewed from the waterfront. At one end of the city area is Stanley Park  the name reminding me of the park between the stadiums in Liverpool  I made my way over for a look. It was a recreational area with several features, including a grouping of totem poles. 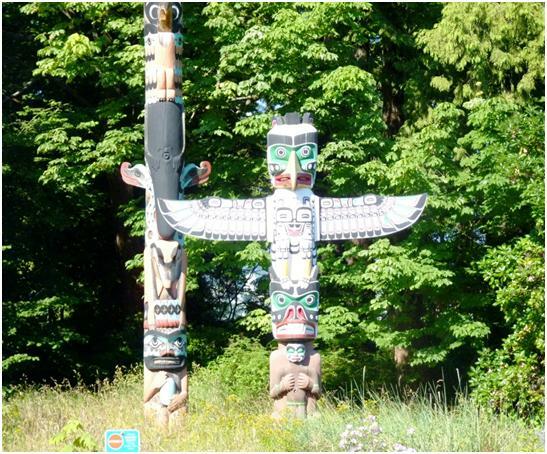 Stanley Park, Vancouver  no football grounds, but several totem poles. For the moment, they play at the Swangard Stadium, which is around a 30 minute drive from the centre of the city. As with most drives in America and Canada, once you are off the motorway networks, progress can be painfully slow, as you charge along for half a mile or so, and then stop at an interchange, where the lights hold you for three or four minutes. Roundabouts are a new fangled idea that have not caught on much in these parts, while busy intersections invariably include a phase for left turns when everything else cannot move, and the traffic turning left gets stopped if there are any pedestrians to cross the other road. The Swangard Stadium is a simple affair, with a track around the playing surface. It has a covered stand on one side, and open seating opposite, while allowing some spectators onto the curve of grass behind both goals. At one end this is a VIP area, while the other is for the more vocal supporters. The stadium is named for Erwin Swangard, a journalist who raised around C$1 million for its construction. An unusual programme came in two parts, each a single piece of paper. One was a glossy sheet with some match details on it, which folded out to be slightly larger than 2 A4 sheets of paper, held longwise. With this, a simple slip of paper, unfortunately slightly larger than the main folded programme gave the two teams’ current rosters, Conference tables, and Vancouver stats. The visitors for the match were AC St Louis, AC standing for Athletic Club. St. Louis are new this season to professional football, although the city has a reputation as being a “Soccer City”, with a club in the old NASL until 1977. The filled their 5,700 capacity stadium for the opening match, but results have been disappointing and crowds have dropped since. With Whitecaps top of their Conference, and St. Louis bottom, (they are both in the NASL Conference), the game looked straight forward for Vancouver  but this did not turn out to be the case. The club made a strange choice of coach at the start of the season, going with Claude Anelka whose only previous experience, (at Raith Rovers, where he got the job by promising £300,000 of investment), ended briefly with Anelka laughed out of town. Anelka did not last long in St Louis either  meanwhile St. Louis have been criticised locally for putting all their investment into the new team, especially after their team in the Women’s Professional Soccer League folded. It was not for want of trying that the Whitecaps did not win the game  they certainly held more of the possession, and were crossing the ball from both wings  it is just that the crosses were uncontrolled and generally went over the penalty area. Particularly in the first half, St. Louis made little of the game  typically of American teams, (especially struggling away from home), they played a five man midfield, with one player in a holding position between the standard ‘two banks of four’. This of course leaves the team with only one forward and in the case of St Louis, he got little support. The second half followed a similar pattern with no score until only 18 minutes were left to play. A rare St. Louis chance fell to Jeff Cosgriff, and his shot was pushed away for a corner. When the corner came in from Luke Krealmalmeyer, Mark Bloom was left unmarked in the area, and took advantage of the lapse to put the visitors into the lead. The USSF ignores FIFA instructions on substitution rules, and allows up to five in this league. This gives a coach plenty of scope to change things, but results in a very disjointed game. Here there were seven changes in the last 30 minutes, five of them for Vancouver. St. Louis almost made sure of the game on 85 minutes when Gauchinho, their Brazilian import headed narrowly wide. It was a miss they regretted, as within a minute Whitecaps’ left back Blake Wagner hit a long ball over the visiting defence, into the path of one of the substitutes, Randy Edwini-Bonsu who calmly put the ball home. A final score of 1-1, and I headed south straight away. With the reputation of the Canadian-USA borders to cause delays, especially for traffic heading into the states, I thought it better to cross late at night and stay in a motel not far south of the border. My policy worked in so far as I did not have to queue, and while at the Detroit border, they had still held me up by almost an hour asking questions and getting me to fill in forms, (which were promptly thrown away), all this border inspector asked was where I had been. I answered “day trip to Vancouver” and did not even mention the football  and with that, he allowed my passage! 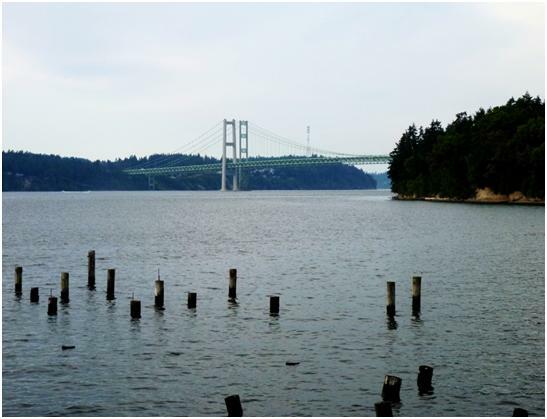 To most people, the name Tacoma either means nothing, or reminds them of the Tacoma Narrows Bridge, which collapse spectacularly in 1940, and more importantly, was filmed as it collapsed. I paid a visit to the site, where two new bridges carry the freeway over a channel of the Puget Sound,. Not only is there no obvious commemoration of the original bridge, but I could not even buy a postcard (showing either). So instead I drove down the coastline for a mile or so, and cut inland to an area known as University Place. 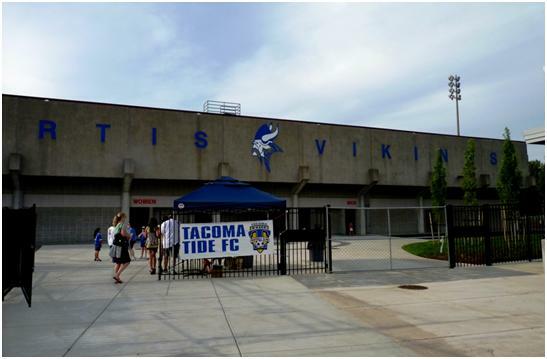 I then found the Curtis High School, home of Tacoma Tide, a PDL level club. The high school grounds has a large stadium with artificial surface. Confusingly, all the markings for American Football, Soccer and at least one other sport are marked out, albeit in different colours. The stadium also has a running track. On the side you enter, there is a large seated stand, covering the whole length of the field, while opposite there are a few rows of metal bench seats on scaffolding. Most of the crowd, estimated at 65 were in the main stand, but a small number including one couple displaying a Canadian flag sat opposite. I thought to enquire as to whether this couple were supporters of the visiting Vancouver Whitecaps, but they said they were just tourists travelling around. I struggle to believe Canadians could turn up here by chance, any more than I did. Now you have noticed that I visited the Whitecaps 24 hours earlier. This time it was their PDL team, under the title Vancouver Whitecaps residency. The exact status of the PDL is difficult to define, teams are only allowed to have 8 players over the age of 23 in a squad of up to 26 players, but nothing stops them playing all 8 throughout the games 90 minutes. Still with a team allowed to name seven substitutes for a match, and then to play six, (subs cannot return after coming off), it is unlikely this would ever happen. In fact few of the teams have more than a couple older players, and Vancouver Whitecaps Residency does not have a player older than 20. Their oldest player was none other than Randy Edwini-Bonsu, who had played 23 minutes and scored the equaliser on the previous evening. As well as Edwini-Bonsu who had started when I saw Vancouver win in Montreal; the PDL team also featured Doudou Toure who was a non-playing substitute on both occasions I had seen them play. Of course, in the USA, the main place for youth football is the college system, and many PDL players also turn out for college sides. Confused markings, for soccer, they use the yellow circle, but also the white centre line. Note the Canadians on the left of the seats. Tacoma Tide, which also runs a basketball club under the same name is just off the running for a place in the play-offs, (they need to finish second behind Portland Timbers U-23 team). There coach is Gerry Gray, born in Scotland, but naturalised as a Canadian having moved at the age of 12. He is a former Whitecaps player (and a dozen other clubs in USA and Canada) as well as having 34 caps for the Canadian team. Tide have three players over the age of 23 in the squad  all started, but two were substituted before the end. I feel the correct two Whitecaps players were in the first team squad, as the pair appeared to be the best the team had on offer. 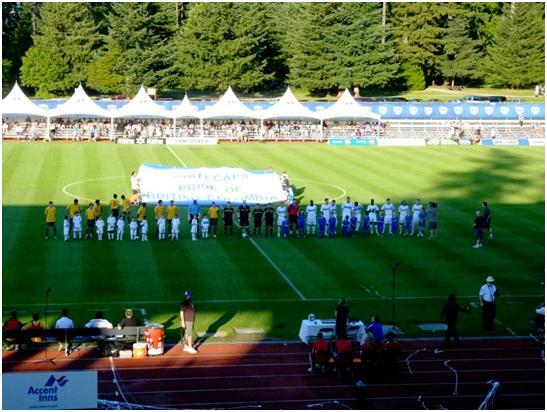 Whitecaps lined up in a 4-2-3-1 formation, while Tide played in 4-1-4-1. With only one forward each, neither side showed much adventure up front. Apart from the confusing markings, this appeared to be a harder surface than other artificial pitches I had seen, creating a difficult bounce. Still, there were a few chances at each end, and Whitecaps should have taken the lead just before the break. Toure was brought down while trying to break through the defence and took the penalty himself. It was not a badly taken penalty, low and to the keeper’s right, but he got down well to save it. Tacoma made the most of this, when six minutes into the second half, Rory Agu (without a doubt, their best player, and one I imagine might be moving to a neighbouring professional side) broke through the defence to score the only goal. As the game went on, Tacoma appeared to have the better of the later stages, which is not what I might have expected, as the visitors assumedly train as a full time team, but there was no other goal to celebrate. Only one substitute more than the normal number in this game  the visitors making four changes in the first 22 minutes of the second period, including taking off both Toure and Edwini-Bonsu. 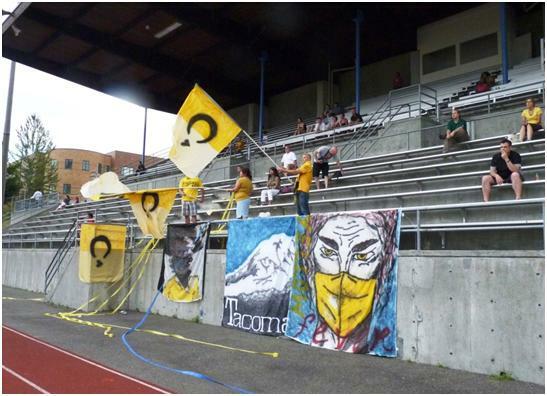 Despite the low turnout, there were three Tacoma fans who put up banners, waved flags and tried to sing through the game. The players appeared to appreciate the support. They held season tickets and went to most home games, but did not travel away. The PDL has a 16 game season if they do not make the play-offs, with the Tacoma schedule for home games consisting of two matches in May (in one weekend), three in June and 3 in July (including two on successive days). It was US$10 to enter, with a season ticket costing US$70. The match programme, which is free, is a single sheet of A4 with one team’s roster on each side, interspersed with a little publicity for sponsors, the Conference table, but no notes. The trio of regular fans said they had season tickets but were uncertain whether they could see the Saturday game, as it was to be played in the state capital, Olympia, about 20 miles away. Away from home, the team has one double header weekend when they visit two of the division’s Canadian teams, Vancouver and Victoria Highlanders  five of the division’s teams are in Washington state, with Portland being the only one in Origen. The Tide Fan Club  the flags show the moon, because as they told me, the moon controls the tide. Meanwhile the poster on the right wears a mask because he is suffering from “Yellow Fever”  the club plays in yellow. Paying the Penalty. Doudou Toure’s penalty is saved by Tide goalkeeper Scott Barnum. Randy Edwini-Bonsu, who had scored for the first team on the previous night, is the player infringing on the right. Driving through Washington state means taking a motorway that is somewhere between the mountains and the ocean. The massive inlet of the Puget Sound is the backdrop one side of Seattle and Tacoma and runs down as far as Olympia. Although neither Vancouver, nor Portland are in this state, they are close to the borders, so most of my time on this leg of the trip was in Washington. To the East, one sees a range of quite high green hills, with a small number of snow covered peaks standing majestically on their own. This is volcano country, and I think it is the volcanic activity that allows some of the peaks to grow aloof from the surrounding hills. I have some time on my way to Portland, so I head inland, and end up by side of Mineral Lake, a setting where the active American can park his RV, do some swimming or fishing, and still get satellite TV. 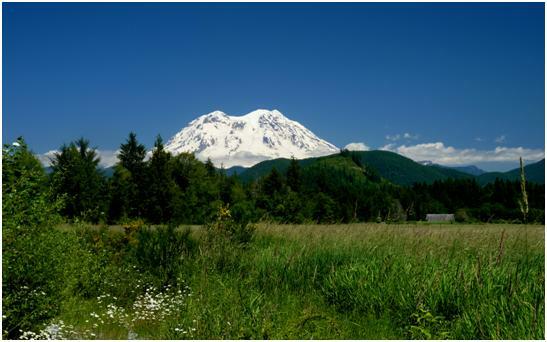 Mount Rainier hides just behind the first line of hills. Twenty minutes later, I get a better view from the roadside. Portland itself is another bustling city, but I have no difficulty parking immediately outside the ground (several hours before kick off). A tram saves me the walk down town, although the distances are short enough (about 20 minutes) that I end up walking back. It has the standard mixtures of new and old (as in 90 or 100 years) buildings, with the older ones always being the more attractive, and a spoilt riverside that is underutilised, and anyway gives you views of the giant motorways that soar way above your head. Another mountain, in this case Mount Hood, occasional shows its peaks in the distance. From the central shopping area, I walked to the riverside, then through a market area and back past some theatres to the centre. 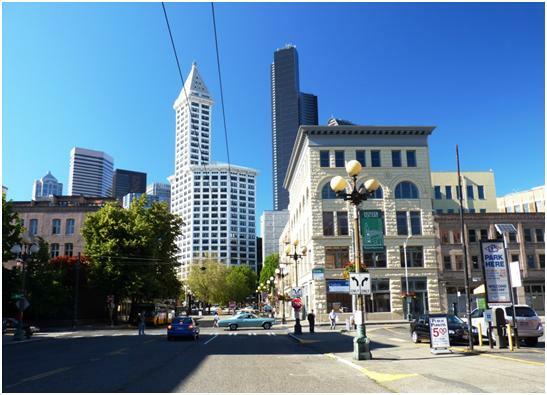 Different styles in Portland  and no the buildings are not an angle, it’s just the effect of a wide angle lens. Portland did boast what I considered to be the euphemism of the month. In one area, where the four lanes of traffic were quite quiet, there was a notice up to say that as an “anti-congestion” measure, to drive a car down this road more than twice in a short period of time, between the hours of 10 P.M and 6 A.M (they don’t like the 24 hour clock) would be committing an offence. Had my schedule allowed me to stay as late as ten, I would have driven down the road, (not more than twice), just to see the traffic jams. As it was, I had a flight at 10.20, and the match was not scheduled to finish until close to 9  so I certainly needed to avoid any congestion. 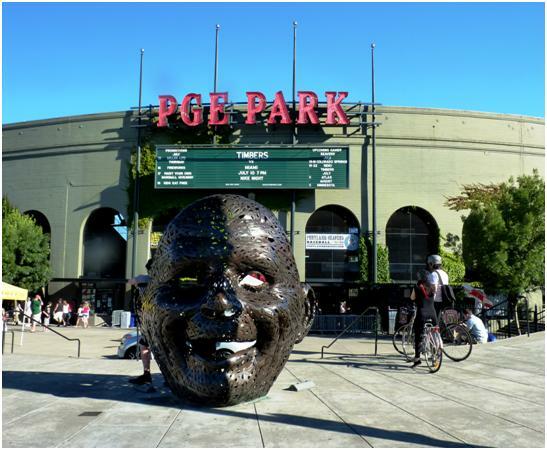 PGE Park in Portland is uneasily shared between Soccer and Baseball (it has had other names in the past, including the bland Civic Stadium when no sponsor has been available. 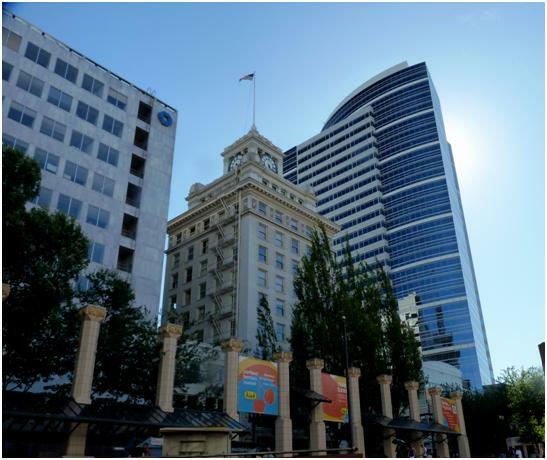 PGE = Portland General Electric). One can see different colours and patches where the artificial turf is replaces after a baseball game, and near one corner, the batter’s plate is still plain earth. There are plenty of seats, but only two sides are properly utilised, the stand behind to goal is a curve, while the main side is parallel to the pitch  but quite a long way back. At pitch level, and for half the length of the pitch, there are tables being used as an open air restaurant with a buffet service. On the opposite side, there is a single row of seats high above the pitch, with a tented area in one corner, assumedly providing some type of food and drink service. Being a baseball ground, there is a concourse behind the seats at the top of the lower tier, selling all sorts of food, beverages and souvenirs. 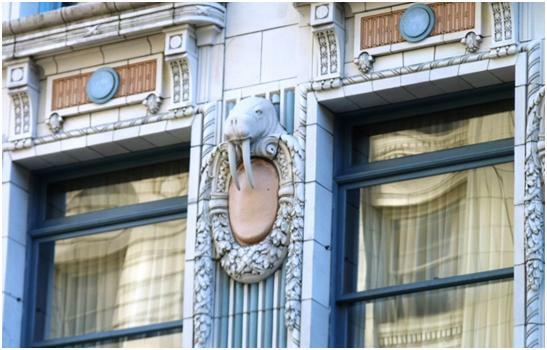 The oddest feature is a small section jutting out from the side of what appears to be an adjacent building. This provides about five rows of seats behind the goal, and suspended about 20 feet above ground level . This building also has a flat terrace at a slightly lower level, from where a few people were watching. Some of these, curiously was watching the game while furiously peddling away on an exercise cycle. 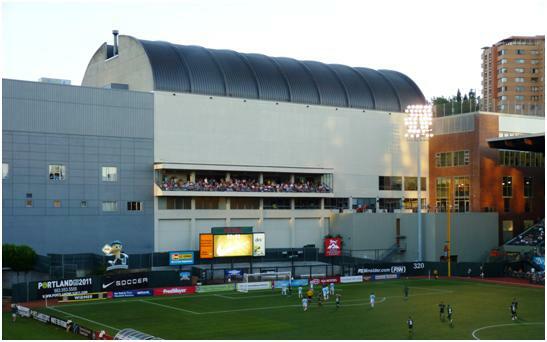 For next season, a new stand will be added on the East side of the ground, and a low row of seats behind the south goal, putting fans on all four sides. The ground will no longer be shared with baseball, allowing it to become a more closed in soccer venue, and while the pitch will still be artificial, it will be a fresh pitch with no joins where the bases once were. The fitness fanatic way to watch football  and yes, the one on the right, while pedalling a gym bike with the temperature well into the 80s, is wearing a green football scarf. 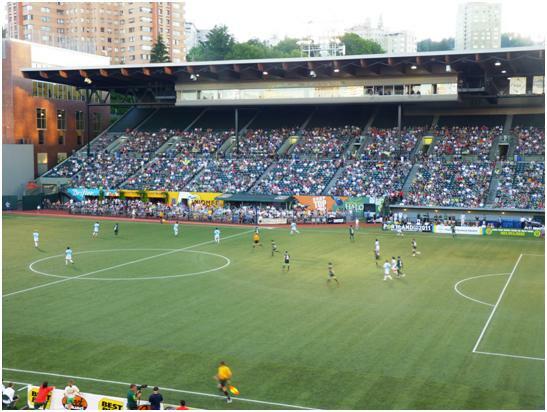 Timbers did not capitalise on an early chance, when DeMartin blasted the ball over. On 15 minutes, Pore beat a defender and ran down the left channel before delivering a pass to the head of Bright Dike, who unfortunately directed the ball straight to Caleb Patterson-Sewell in the Miami goal. While Portland were playing a straight forward 4-4-2, the Miami formation was more complex. Listed as 4-3-3, but the right full back had a tendancy to push forward, while he left sided counterpart did not. All of the midfielders were either centre or left, with the right side being dealt with either by Euzebio Neto, the full back moving forward, or Edward Santeliz, a forward dropping back. This was not a technique that was really affective, and most of Portland’s chances in the first half came from this channel. Pore came close to scoring again on 28 minutes, shooting across the goal to the far post. Miami wasted a rare attack when Paulo Araujo shot wide from at least 35 yards with other, better options available. The left side continued to be the place where Portland piled on the pressure. Portland finally took the lead in the 48th minute, when a free kick from the right appeared to hit Ross Smith, who still needed to goes to get the ball across the line. Surprisingly, the home team did not push on from this position, and instead it was Miami who now came to the fore, with Christian Gomez finding space on the right on several occasions, but always failing to deliver the ball accurately. It seems a common failing in this league that players need to take too much time on the ball before passing or shooting, and this was certainly Miami’s problem. Still they certainly should have levelled the scores in the 79th minute. Three times, Miami players had shots blocked or saved in a single move before the ball was bundled away for a corner, which was over hit and ran to safety. Behind the goal, with the small stand. Another few rows of seats will be added close to ground level next season. 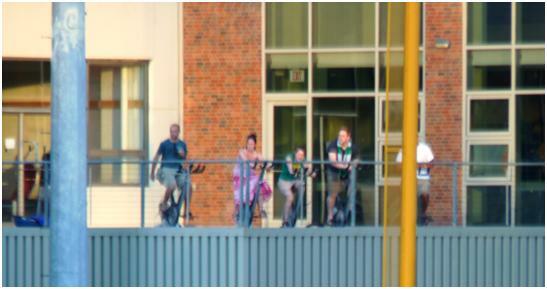 The fitness cyclists are on the right, between the floodlight pylon, and the yellow pole (which marks the foul line when baseball is on the stadium). Mandjou Keita missed a golden chance to make the game safe in the 88th minute, somehow managing to pull the ball past two defenders, but then hitting a shot wide. This left Ryan Pore with the job of showing how it should be done  picking up the ball in midfield, he accelerated past two defenders, and then calmly slotted the ball past the advancing goalkeeper, much to the satisfaction of the Timbers’ very noisy home fans, who had kept up a good series of chants throughout the game. 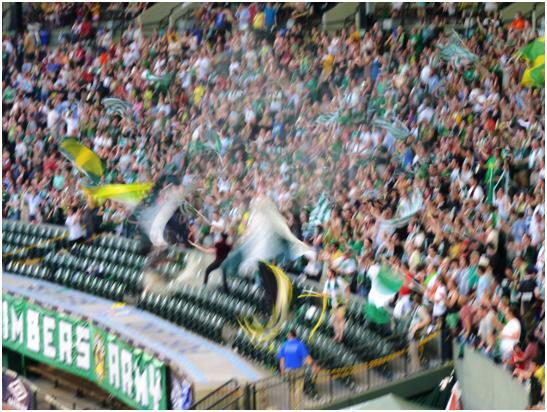 More than any other group of fans I had encountered, those behind the goal at Portland were mimicking the best habits of the English, waving flags and scarves, and singing some of the same songs. Two whole days on my trip without a football match  so just what I am to do? Well, I am travelling by car, and obviously there is some scope for sightseeing as I drive north back from Los Angeles, with no plan until a 7 a.m. flight off San Jose. I started by driving up the Pacific Coast from Santa Monica to Ventura. It was not as interesting as I thought it may be. Picturesque in places, certainly  but no more so than 100 stretches of European coastline. As was a grey overcast start to the day, and there were good waves for the surfers visible at every public beach, but it was also amazing how many people were picnicking in cars overlooking the beaches, or in some cases on the other side of the four lane highway! 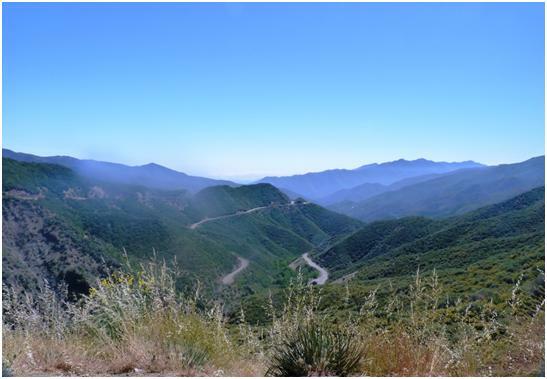 I left the coast and drove through a place call Ojai, where I stopped and brought a Turkey Club Sandwich  I thought I would be able to eat it while driving along  but it was over four inches thick. The drive over a mountain pass was quite spectacular, taking me quickly up from sea level to over 4000 feet, and then down almost all the way, and just as quick  leaving me on a wide plain littered with the nodding donkeys used to pump up oil. Driving up the plain, I ended up at a sizable town called Fresno. 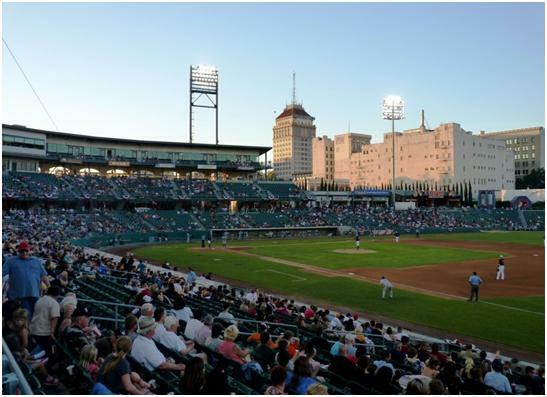 Near the centre of Fresno is Chukchansi Park, home of both the Fresno Feugos soccer team, (playing in the PDL), and Fresno Grizzlies Baseball Team. The stadium was originally called Grizzlies Park, but has taken on its current name, thanks to a sponsorship deal. The name comes from a local tribe of native American Indians, while the sponsorship comes from a casino on their lands. As you can see from the picture, this is a decent sized stadium, with a decent sized crowd, although I found the official figure, over 8000  difficult to believe. 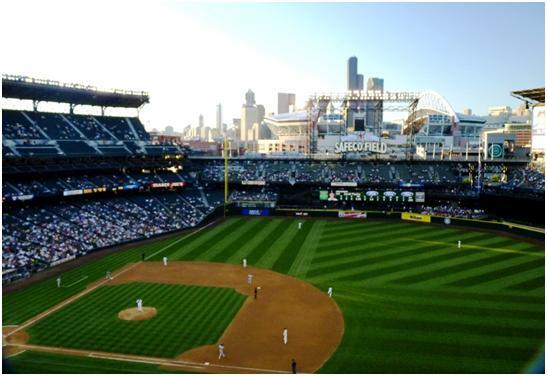 If the figure is correct, and a baseball match can attract a paying crowd of around 8000 a time  and play the same opponents in a series that runs for three or four successive evenings, it is easy to see that this has the requirements for a successful professional sport. And Fresno is not part of the MLB  Major League Baseball  for which the scores are easily found in England. The Grizzlies are in fact a Triple-A rated Minor League team. This is the top level of the Minor League, but of course, there is no promotion for the best teams to the major league  a franchise can only attempt to buy a franchise at the higher level. The players, of course are awaiting their chance at the top level. The Grizzlies are an affiliate of the San Francisco Giants, which means that most (might be all?) of their players are actually under contract to the Giants, as well as the coaching staff. The Giants have another five affiliated teams at lower levels of the minor leagues, with these players hoping to move up the rankings from the lower teams to the double or triple-A from where it is possible to jump up to the major league roster. I arrived in Fresno barely before the scheduled start time, and found quite a queue outside the ground. As a result, by the time I had bought a ticket (US$10) and entered the ground, the first innings had been completed, and worse still the visitors, Colorado Springs Sky Sox were 4 runs to nil ahead. The next couple of innings were somewhat dull, but were over quickly. There was hardly a ‘hit’ in these innings. (This is when a batter hits the ball far enough to run to the first base before they fielders can get the ball there  the ball must be in play (not behind the foul lines), and it is out if the ball is caught before bouncing. If the ball is hit directly into the crowd (not behind the foul lines), then this is a home run  allowing the batter to complete a run around all the bases, and all those already on the bases to get home  so a home run can score 1, 2, 3 or 4). The game turned on the fourth innings, when the home side suddenly started hitting the ball correctly, (perhaps the pitcher was tiring), and ran in six in the innings. Unlike Cricket, an innings does not involve every member of a team having a turn to bat, but a rotation of players ending when three men are out. The fifth and eighth innings involved both sides scoring one run, and the game finished after Colorado Springs failed to score in the ninth (and final) innings. The home side always bats last, and as there is no actual limit to the number of runs that can be scored in an innings, there is technically, always hope. The final innings does not happen if the home side is already ahead. Naturally, I was in town to see the baseball  and mindful of the delays the previous night, I headed to the ticket office early  buying a top tier ticket for US$17. From the car park, I had to walk past Qwest Field  normal home of Seattle Sounders, (and also the American Football team, Seahawks). To be honest  the early ticket buying here was not required  there was no shortage of available seats, and no crowd around the ticket booths just before the start. As a bonus, if I had waited, I could have dealt with a tout, and bought a ticket significantly below face value! Close by the football and baseball fields, I found a couple of bars selling local ales. America is not a beer desert  wherever one goes there is a selection of lagers, light ales, and almost always a stout and a Hefeweizen. Dark Ales are a little less common. When I asked at one of the bars in the centre about the next morning’s World Cup semi-final, he suggested not watching at the bar I was in, but heading instead to an area called Fremont. This is a recommendation that was well worth the effort, although the extremely busy “British Pub”, the George and Dragon was too busy  meaning watching in the open air in a very hot courtyard, and I switched at half time to another bar, still busy but with room to sit down and watch from inside, (cooler, darker). As for the baseball, the Seattle Mariners are in the middle of a bad run, and were playing four games against the Kansas City Royals, and were then going to follow with games against the New York Yankees. In may game, Seattle went ahead in the third innings with a home run, but then Kansas pulled themselves ahead by degrees scoring singles in the fifth, sixth and eighth. Seattle also scored in the eighth, pulling back to 3-2. This led to a tense final innings, as the home fans willed their team to score (in vain). It was however clear  even to the untrained eye, that the better team on the day won. In fact, the better team continued to win, as Kansas had a clean sweep (winning all four), and New York have won twice since as I write. Still, the claimed attendance for my game was over 17,000 (the stadium holds at least twice this). Seattle did a monthly magazine, which features on all the teams visiting the Safeco Field (no prizes for realising this is a sponsor’s name) in the month, while Fresno did a smaller programme which dealt with a single series of games and one opponent only. I noticed that from my seat (and for that matter any seat), it was almost impossible to say whether a pitch was good or bad. There were a few people nearby who had extraordinary powers of vision and claimed to know a ball was good (generally pitched by Seattle) or bad (pitched by Kansas), but these must come from the same group as those who can judge offside from behind the goal at the wrong end of the field. The only pitches I were certain of, could be said to be “very bad”. The decision therefore rests entirely with the umpire behind the plate. What was very noticeable is that there was hardly ever and dispute, and absolutely no analysis or criticism on television. The pitch may be replayed, but it is never analysed to see if the decision was right. Although the big debate about video referees was repeated on American TV  with the overwhelming opinion being in favour, and the suggestion that not having video evidence could harm the progress of the game in America; Soccer was never compared to baseball in this regard. I was told that baseball officials did not want to break up play with the delays. But we had a delay at one point in each game, when the group of umpires decided they needed to discuss a point. There was time for a few beats of music (trying to get a response from the crowds, which in both games tended to watch quietly) before any pitch; and the game came to a stop every ten minutes or so at the end of the innings. At Fresno, these breaks were almost always filled with some other “action” on the field, whereas at Seattle, most of the “entertainment” was on the scoreboard. Most of the items at Fresno involved kids on the field of play, but one of the few I appreciated involved the pitch sweepers (who come on to smooth the dirt between innings) doing a dance routine. It is also obvious that the crowd is always in motion at both games. Very few people go to a ball game and see every pitch. The concourses behind is lined with stalls and concessions, selling food, club merchandise or just advertising goods. Once I took my seat at Fresno, I stayed in it until the end, whereas at Seattle, I went for a comfort break and a sausage about half way through the game, but starting at an innings break, I missed only about two or three pitches. Incidentally, apart from the larger crowds the main difference between the Major and Minor League is accuracy. Far more pitches in the Major League game were good, and far more were hit. 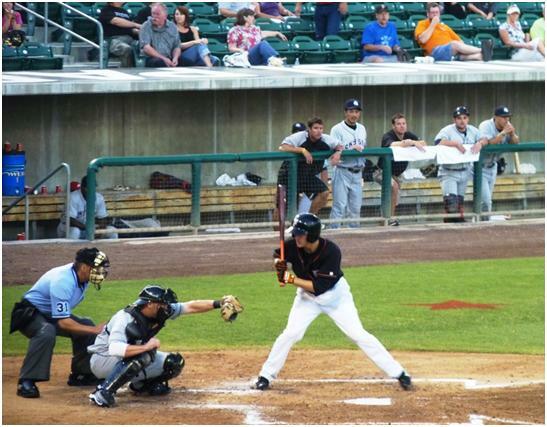 Of the balls that were hit, the ball went in the correct direction more often, whereas the Minor League players struggle to control the ball with a round bat. My guess is that if there is such a thing as amateur baseball, it would be almost unwatchable, unless the pace of the pitching was significantly reduced to increase accuracy. I guess I could get used to baseball, although I imagine that spectators that watch every game of the home series are rare. After all, a baseball season involves around 80 home games. From what I could gather, a season ticket was not an admission ticket, but a discount card. The distances in America being what they are, away fans are a rarity in any sport, (although I saw Seattle fans in LA). Still, the next day would bring me back to soccer. So, as at least one friend asked when told I was heading this way, “Do you know the way to San Jose?” The answer ought to be simple, all you do is “Get on board a Westbound 747”  except in my case it was an Airbus A320 for four and a half hours, and then two more hours on a 737. During my last trip to the USA, in 1999; I had seen San Jose Earthquake’s predecessor, San Jose Clash playing at Chicago Fire, then at Soldier Field. It was the only game I have ever been to, that used a shoot out after a draw. On the same trip, I saw DC United, then the dominant team (champions in 1996, 97 and 1999; they also won in 2004, but not since). Of course, the MLS uses a play-off system to decide the title after the regular season, and this has not always favoured DC, who were top of the regular season rankings in 2006 and 7, but both times lost the title to Houston Dynamo. 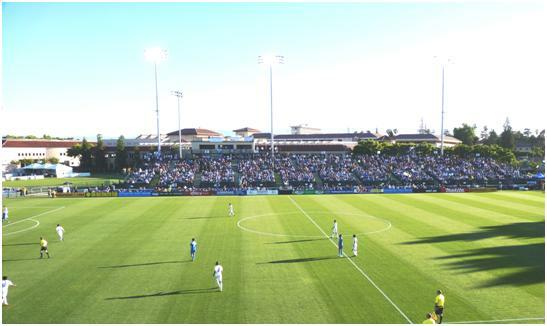 San Jose (they have been Earthquakes, rather than Clash ever since the end of the 1999 season) were champions in 2001 and 2003, but left the league after the 2005 season. 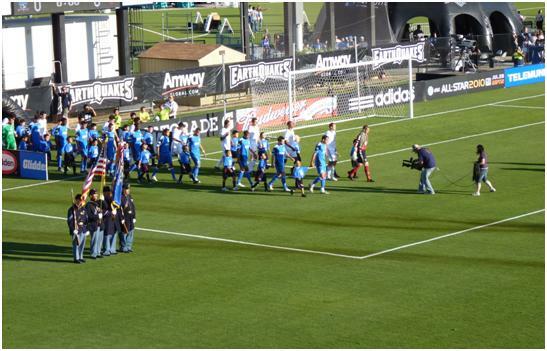 The owners of the franchise decided to move to Houston, creating Dynamo  but the league called this a new franchise, allowing the Earthquakes name to return, under new ownership and at a different stadium in 2008. The Buck Shaw stadium is part of Santa Clara University, and lies close to San Jose airport, (you could walk it, but you would get odd looks from people driving past). It is not the ideal stadium, and holds only 10,500. None of the seats are under cover (but then, surely it never rains in Northern California? ), and there are quite large sections with no spectator accommodation. The longest stand completes one side, goes around the corner and finishes about half way behind the goal. The seats are bench seats, but renovations mean they are aluminium, whereas the pathways between them are planks of wood, and look quite old as well. These sides are built over a solid banking. The opposite side, is taller, but only fills three quarters of the side  this side is of a scaffolding construction. The lower section of this has blocks of individual plastic seats, while more benches are above. The pitch is natural grass, and looked to be in remarkably good condition. The temperature at the start of the game was around 28°, but it cooled after the sun went down midway through the second half. There are plans to move to a new stadium, but this is not likely to happen until at least 2013. Occasional big games have been played at the Oakland Coliseum, home of the Athletics Baseball team, but this is really too big a stadium for their crowds. 10,304 were at the Buck Shaw, which means the stadium was close to full. 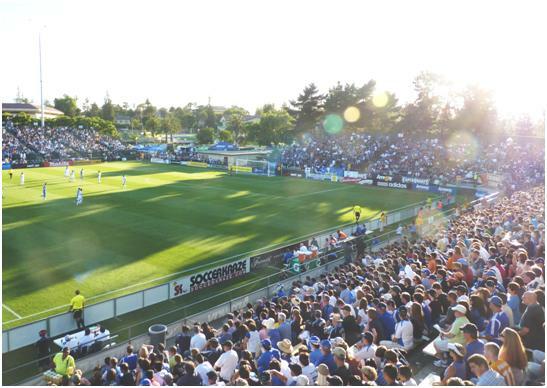 After a series of less effective attacks, including one which had the ball in the net, but disallowed for offside, the Earthquakes opened the scoring on 15 minutes. Ike Opara latched onto a loose ball after a corner was headed down. Former Reading winger Bobby Convey shot wide in the 22nd minute. It was more than half an hour into the game before DC managed an attack worthy of the name. The first of these ended with an offside, but the Earthquakes were forced to defend a 37th minute chance. From their second corner, DC got a header on target, which Convey cleared from the line. These moves appeared to be a blip though, and the half ended with San Jose on the attack again. Earthquakes continued to have the better of the early second half, so it came as some surprise when DC levelled the scored after 54 minutes. Stephen King was being shepherded away from the danger area, but was then given space to turn and cross the ball to the far post, where Andy Najar slipped past his marker to level the scores. Two minutes later, home keeper Busch had to get down sharpish to stop a long distance shot from Pontius. The action soon moved back to the other end, but while San Jose had most of the ball, they did not make the best of their chances. DC United should have gone ahead with fourteen to play, the home defence failing to deal with a long ball, giving Santino Quaranta a chance, which he ballooned over the bar  at the other end, a cross from Wondolowski should have given substitute Arturo Alvarez a chance as he had space inside the area, but he failed to connect. A 25 yard strike from another substitute, Cornell Glenn tested the DC goalkeeper, but did not find him wanting. San Jose really should have found the way on 88 minutes, when a cross from Alvarez went past everyone, except Omar Jospeh, whose short was deflected wide for a corner. DC were clearly happy with the draw delaying the play with substitutes in the final minute, and in injury time. The last player to enter the field was former Australian international, Danny Allsopp. (I am assuming the word former, Oz coach Pim Verbeeek described him as “absolutely useless” after his last appearance, 17 months ago). With that, the game finished at 1-1. Although the 16 team MLS has 30 games, and a standard play everyone home and away format, it is still divided into two Conferences, East and West. In practical terms, the top eight are likely to make the play offs, with the rules demanding this includes a minimum of two from each side. With this point, San Jose are fifth on the Western side, but have the eight best record to date, so may just be in line for the play offs, (the season is less than halfway through). DC United have disappointed their fans, and are 7th in the East, one of four teams on 11 points at the foot of any combined table. 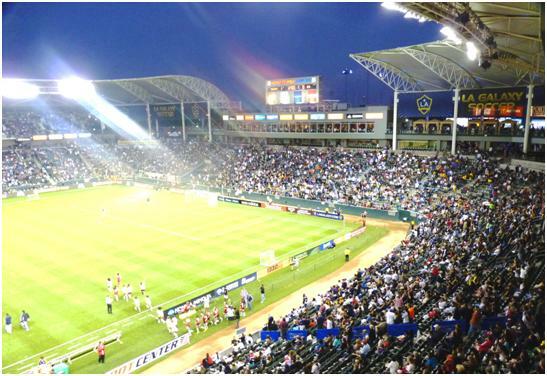 Top of the table is LA Galaxy, and this was my next port of call. Before I headed south, and interesting finish to the evening. I had been traced on the internet by one Michael Hoenig  and although he lives in Colorado, well away from the route for this trip, it turned out that his brother, Bruce lived in San Jose. Anyway we arranged to meet, and he came over to meet at the motel and then, along with Bruce’s daughter Jessica and her friend Anna, we went out for a Pizza, (a bar was out of the question, as the legal drinking age in California is 21, and the girls were 19  and they check ID, I had to show mine to get a beer at the airport). Turned out that the Pizza shop had a selection of beers, including a summer ale very similar to some golden ales in the UK. I have never met anyone called Hoenig before, with the exception of my immediate family. My general assumption is that Bruce and Michael are not blood relations, but Bruce has done a lot of research into his family tree and it appears that his family originates from the same areas that mine does. Another co-incidence, both Bruce and I have Chinese wives! Should there be a word for this type of meeting, maybe the Gorman moment? The drive from San Jose to LA was more straight forward than I thought. Most of the route was a straight road across a wide plain. There was little scenery, and not even many towns on the route. The general colour was yellow, with much of the land being grassland, now dry due to a lack of rain. Bruce had told me that there are two basically two seasons in California, a dry season and a less dry season. At the moment we are in the middle of the dry season. There were areas of greenery, where crops (mainly fruits) were being grown, thanks generally to irrigation schemes. Water is an issue, as signs next to the road suggesting a changing certain members of the house of congress requested. Clearly, with more irrigation and more water, the farmers could easily grow more  but no doubt this is not the whole issue  as water does not simply fall out of the sky, (well, not here it doesn’t). 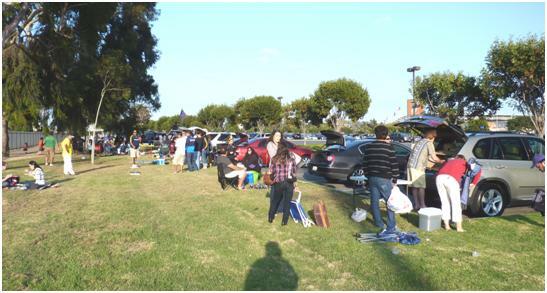 On a warm evening, many people had arrived at the stadium early, and when I arrived, grass banks at the edge of the car parks were filled with people enjoying their picnics. If arriving early enough to get a place by the bank, then it appears the family will always settle immediately behind their own car. When driving past the beaches the following day, I also noticed that this desire of many not to stray too far from their vehicle. In some cases, this meant parking on the opposite side of the four lane roadway to the beach, and then not even crossing the road before setting up the picnic. 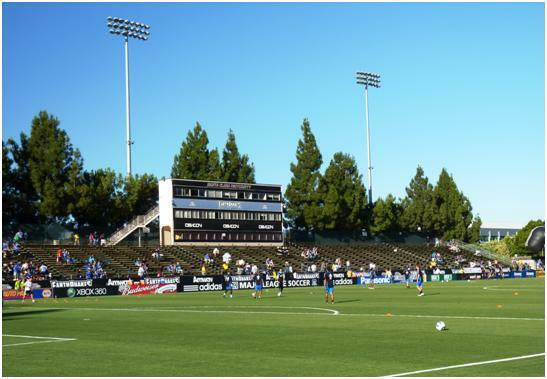 The Home Depot Centre Stadium is in Carson City, south of the central LA, and not far from Long Beach. I would say it is the best of those I have been to so far. The lower tier is uniform all around, and consists of at least 30 rows of seats. These are individual plastic seats along the sides, but metal benches in the corners and behind the goals. The main walkway is above the seats, always a better option when it can be accommodated. The walkway level is the same height as the surrounding ground  so the pitch is at a generally lower level. Above this, the situation is different on each side. On the West side, there is a row of executive boxes with a central section above this for the media. To the south, there are a few executive boxes, with what appears to be a restaurant on the higher level. There is a small patio above one of the boxes at the end of this. The east side has a second tier of seats  the only side with this. Most unusual is above the north side, where a steeply sloping grass bank rises above the seats, to a semi-circular top fence and pathway. Many members of the crowd had set themselves up, sitting on blankets during the game, while more gathered here at the end, to await the after match firework display. The roofing was of the membrane type  a good lightweight solution for providing more shade than rain protection. It sits above all of the long sides, and turns the corner to also provide cover over most of the south side  although there is a gap in the centre. There is no cover above the north side. LA could have had an early goal when Michael Stephens, shooting from the right hit the post, but the ball rebounded into Kasey Keller’s welcoming hands. This was the start of a series of attacks for Galaxy, who dominated the open stages, although after this first chance, the attacks were blocked by Seattle defenders and the best LA achieved was a corner. Keller dealt with a long shot in the 18th minute but then fumbled the resulting corner, and Buddle almost got on the score sheet. This was put away for another corner, and this time Donovan’s corner was firmly headed into goal by Buddle. A gap in the home defence could have allowed an equaliser in the 33rd minute. Steve Zakuni was allowed to progress unchallenged down the right and send a good cross in, but Pat Noonan failed to connect properly. Even then the Galaxy defence failed to boot the ball away, allowing Noonan a second bite, this time blocked. On 40 minutes, a Donovan free kick was deflected for a corner by a defender less than five yards away from the ball when kicked. The referee waved aside (only slight) protests, Donovan took the corner, and Buddle again got a header in. This was cleared back to Donovan who tried a shot from a tight angle, which was comfortably saved by Keller. Catching the defence flat footed, Alan Gordon advanced down the right in the 77th minute. His cross was too short to reach the only attacker, but he was helped out when James Riley managed to beat his own keeper and give Galaxy their third goal. Soon after, Tyrone Marshall was cautioned for bringing down Juninho. The Brazilian took the free kick himself hitting the ball narrowly wide from about 25 yards. Again Keller appeared bemused. Juninho was then replaced by his compatriot and fellow loanee Alex Cazumba. Cazumba’s first action was to get himself booked, leading to a similar free kick, which Seattle forward Tristan Bowen hit well over the bar. An injury time save by Donovan Ricketts stopped Mike Seamon from pulling a goal back, and while Nate Jaqua got his head to the resultant corner, his header went well over the bar. 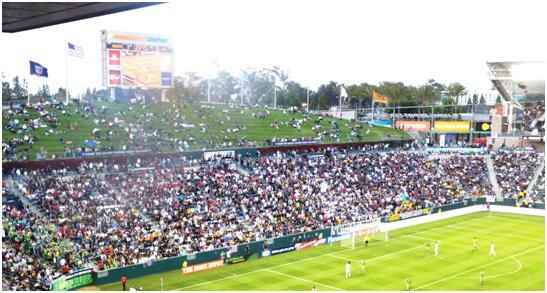 Two sections of the ground were saved for “singing fans”, with the two fan groups called the Angel City Brigade (behind the goal to the North), and the LA Riot Squad (South East Corner). I reckoned the brigade was ahead on noise made. The North West Corner had a small group of Seattle fans. At the start of the game, and whenever a goal was scored, the sky was filled with small pieces of yellow, blue and white paper, which fluttered slowly to the ground, ending up by littering areas of the pitch. After the game, we were treated to a fine fireworks display, and the playing of a series of patriotic tunes and military marches (well it was July 4), much of the crowd of 27,000 stayed around to see this. Demonstrating that some clubs can do better than others  despite a bigger crowd than Toronto, and more travelling by car, (well the car park is bigger)  but there was no queue of cars leaving the ground when I left. In England, the habit of putting up the St. George’s cross is reserved for when England are playing in a major football tournament. While Americans have not taken to flying flags from the sides of their cars, the flag is more prominently displayed in front of houses and houses, and of course, the national anthem is played before sports events, even with the low attendance for matches such as the PDL, (indeed, at Kalamazoo, both US and Canadian anthems were played). Crossing the border to Canada, one still sees national flags that I would guess are always displayed, plus an increase as people get more patriotic as Canada Day (1 July) approaches. There are even some cars that are flying small Canadian flags, but there are just as many flying other country’s flags for the World Cup. Most popular among these is the Portuguese flag, with Germany a distant second. Indeed when I entered the country, the customs official asked if I was escaping after England’s poor performance. When I said, yes  but Canada did not even come close to qualifying  he replied that he was Portuguese, and would be coming off shift before they played Spain. I wanted to keep on the road, so I drove about two hours from the customs post to the City of London before stopping an quickly finding a sports bar, watching most of the Portugal-Spain match. There were a group of rowdy Portuguese supporters in the bar, and a smaller (and quieter) number supporting Spain. The early game I did not see live, but saw a replayed evening transmission when I stopped for a meal. Still, ,most of the afternoon and early evening was spent on Highway 401 which runs from Windsor (connected to Detroit by toll bridge) up the north side of one of the lakes and up to Montreal. The only traffic problems I encountered were around Toronto. The odd thing about the Canadian motorway is that I spent my first two hours on a fairly quiet road, but the traffic kept in the main to just a smidgen over the speed limits. As I approached Toronto, the traffic became busier, but the speeds became faster. My theory is that on the open road, it is relatively easy for the police to pick on a speeding motorist, but there is safety in numbers, so cars feel safer to go fast in a group, knowing the police cannot stop them all. Safety is of course a relative term, as tiredness and boredom is more likely to set in while driving slowly (well 70 mph, the speed limit is 100 km/h, or 62 mph) on an open road, while one needs to concentrate in a busier area. I made my overnight stop about an hour’s drive beyond Toronto, with a meal and a beer first, so it was late when I settled down. In the morning, I was not quick starting and then took some time to drive off the motorway. The motorways are full of traffic, but coming off the main road does not help to explain where everyone is going to. The secondary roads are remarkably quiet  not many people take the alternative, and the road itself is slightly disappointing. Despite running parallel to the edge of the lake, and the St. Lawrence river, there are few scenic opportunities to stop and admire. Some of the small towns have marinas, full of pleasure craft, but the river, when you get to spot it is clear of traffic. The towns are all of a muchness, pleasant enough places with small malls and plenty of parking. Not many people around though. As you drive in and out of these towns, most of the housing is wooden fronted, standing well back from the road with a perfectly manicured lawn in front (no fences at all  Canada is not part of the land of picket fences). All the lawns seem to be cut to a uniform size, leading one to wonder whether the residents cut their own, or if someone cuts the entire lot in a broad sweep. If everyone cuts deals with their own, then the question is who inspects the mowers, to make sure all the grass is the same length, and is there a National grass cutting day  to make sure it is all cut at the same time. Oddly, considering the schools are out and it is a holiday weekend, there were no children on these lawns – in fact, there were no people on the lawns at all. I do not feel I would make a good Canadian, with my unkempt garden wilderness lying untended back home. Shortly before arriving at Montreal, one crosses from Ontario to Quebec province. The road number changes, the quality of road surface deteriorates badly, and when you stop, people speak to you in French first. Often they keep on speaking French even after you have spoken in English. As in France, I just ignore them unless I am trying to pick up some information. The French speakers, (whether in France or Montreal) seem to stick to the same policy, jabbering away even when it is clear they are not being understood. They do not even take on the English habit of speaking slowly and loudly to get the message across. 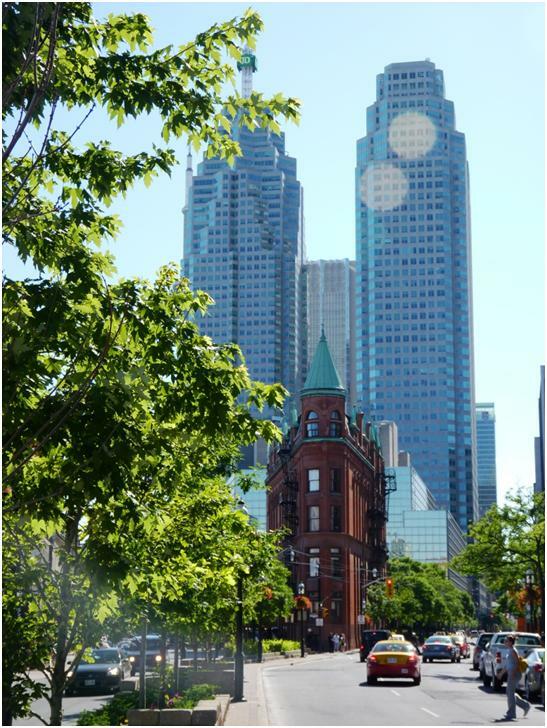 Montreal is an interesting city, with a contrast between the older parts (which of course are not much over a century old) and modern buildings. The older buildings sit like slabs of stone, with ostentatious touches. The new buildings, like any modern city are a mixture of the mundane, and those trying to stand out. If you venture away from the main road, the backs of the buildings are the domain of graffiti artists with fire escapes hanging in the air, and large waste containers huddled against the walls, waiting for the garbage trucks. In the end, it was disappointing that I had not allowed more time here, (I was over an hour later than I planned in arriving anyway, having spent longer on side roads, and then the traffic into the town being difficult). Naturally, the only rain storm so far on the trip came as I tried to explore a small central area of the city. 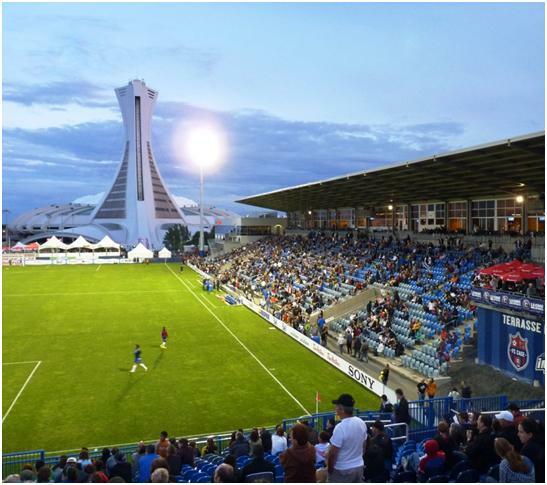 The Saputo Stadium is on the Olympic Park, next to the Olympic Stadium. Montreal staged the Olympics in 1976, but the stadium was only completed in 1987. It now stages Baseball, American Football and the occasional soccer game, (AC Milan have played there recently), but with a 76,000 capacity, it is still considered a white elephant. The stadium is known either as the big O, referring to its doughnut shape, or the big owe, referring to the bills that the city have only just paid off for its construction. By comparison, the Saputo stadium is a modest affair. Behind one goal and all along one side, there are large banks of seating, built up on a steel and aluminium construction  and without a roof. The main stand is slightly lower, with more concrete in the construction and a roof that will protect the crowd if the wind and rain is from the North, but not from Southerly storms. Unusually, the main stand is the Northern side of the stadium. At the back of this stand, there are a number of boxes, some given over to media, the others for sponsors. There are a number of other areas reserved for those people who have either paid a premium for the tickets, or got them from free from a company paying for the hospitality. Behind one goal, there is no stand, but a series of small marquees, and at both ends of the main stand there were terraces with people eating and drinking in restaurant fashion. The tables had individual seats, and bar umbrellas. The pitch was 3G artificial, and played well. The bounce was normal, there were no clouds of the black dust seen on some artificial pitches, and the ball did not speed away to the sidelines. The crowd for the match was just shy of 12,000. How much of the much some of them saw was uncertain. Despite the match being advertised as 7.30, and actually kicking off at 7.47, people were still swarming around the entrances for at least 20 minutes after the game started, and the last paying customers did not arrive until near enough half time. Meanwhile, the path at the front of the stand was a constant highway, with people heading back and forth to the concessions in the corners of the stadium. Ticket prices were generally from C$20 up to C$50. All prices were available on the night. I had looked at the on-line sales process, and this added a total of C$10 to the price, a service fee, and C$2.50 simply for them to deliver the ticket to the stadium for collection, (the only option available if booking from outside Canada). 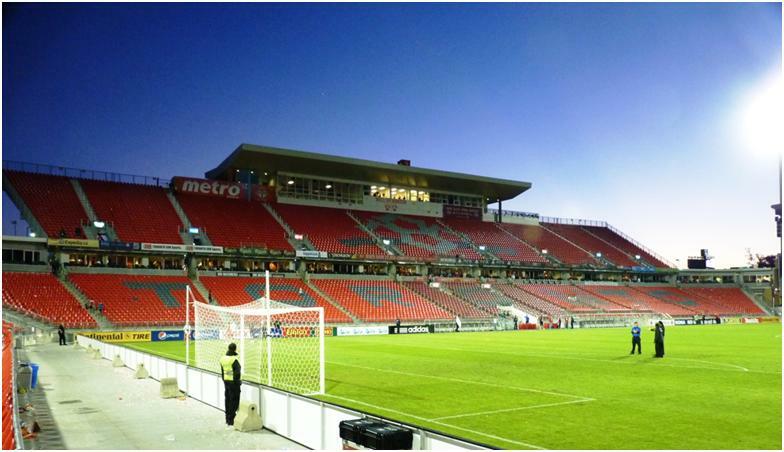 The name Saputo stadium comes from the club’s owner, Joe Saputo, who operates Canada’s biggest dairy products concern. I am fairly certain though that the stadium is owned and was built by the city. This is the fourth time the teams had met this season (twice in the league, and twice in the Canadian Championship  a tournament between Montreal, Vancouver and Toronto to select a contender for the CONCACAF champions league). The teams play in a 12 team, 30 match league and will meet twice more later in the season. All three previous meetings were drawn. Montreal made a good start when in the third minute, Leonardo Dilorenzo took a free kick on the right hand side, floating it in for Tony Donatelli to head home, and in the ninth minute came close to repeating the feat, this time Byers heading wide from a free kick delivered from the left. Montreal continue to dominate the first half, and many people in the crowd thought they scored again on 30 minutes, when Byers went past the goalkeeper, but hit the ball into the side netting. Vancouver made a substitution at half time, and came out with a more attacking formation. This paid off with Vancouver now having much the better of the play, and deservedly getting level in the 66th minute, the ball being worked in with close passes from the left until it reached Janicki, who turned the defender and placed a low shot beyond the keeper. This at least woke up the home side, who had been dozing through the second period. The thought they had restored the lead when first Byers, receiving the ball from Philippe Billy forced a fine save, and then the ball was returned via Billy to Byers who crossed this time for Dilorenzo to put into the net. Unfortunately, Byers was off side when he received the ball for the second time. This turned out to be a rare play for Montreal in the second half as they produced little else, and it appeared the game would end in a draw, until Luca Bellimisomo turned and shot from just outside of the area in the first minute of injury time, and gave Vancouver a surprise win. On the first half performance, Montreal should not have lost this game, but they only managed a single goal in this period, and never really competed after the break. More than five hours of driving from Montreal to Toronto, I did around two hours after the game, not returning to my motel until well after midnight. Thursday was Canada day, and clearly the real start of the holiday weekend. Most of the traffic, though seemed to be heading out of Toronto, and I had a clear run, while there were many jams heading east. Still, when I arrived in the city, it was lively. I found the old city, and was pleasantly surprised to discover that the “flatiron” building had a pub in the basement  immediately flagged for a visit after the game. Even busier was the lake front area  with more time, it might have been possible to walk all the way to the stadium, but time was limited, and my feet were already blistered, so it was the tram for me. 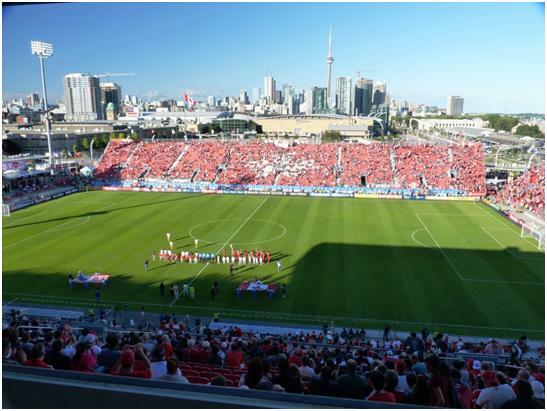 Toronto has a spectacular skyline, and it may just be that the best view can be had from the upper tier of seats at BMO Field. 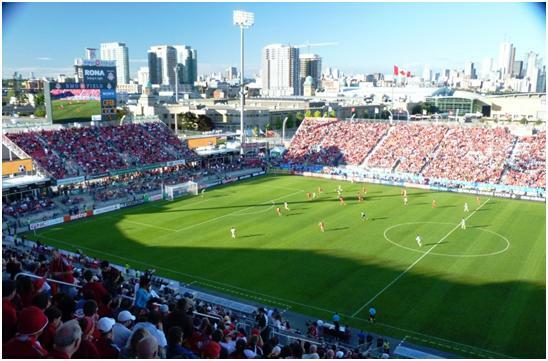 The stadium is what is known in Canada and the USA as Soccer Specific, that is to say, it was designed with the soccer team in mind, rather than being original used for another sport, or a multi-purpose arena. The four sides are therefore square to the pitch. Three of the four sides are open, and the roof of the main stand is small and high. The stand itself is a very tall affair, arranged in two tiers with a row of executive boxes in between. These boxes extend around to provide the only section where the corners are filled in, but it is not all executive boxes. A small open air terrace near one end box was given to a small steel band, who drummed continuously through the game. While the upper tier has the views, it also has a very steep rake. On the east side, there is a fairly big affair, some 40 rows of seats in a single tier, while behind the south goal the stand rises only about half as high. These three stands are all concrete, with one corner reserved for the “singing section”. Almost all the fans on the south side stand up, even though they all have seats. The north side is somewhat different, with just about four or five rows of concrete. Raised quite high above this for about half the width (central) is a steel and aluminium stand of around 25 rows. The main scoreboard sits above this stand. Each side of it, are low buildings, which I assume are concessions or VIP sections. The one nearer to me had bar type tables outside, whereas the other had quite a few people standing outside. Screens above these showed the match on a relatively small screen, with advertising on a much bigger area. Both teams lined up in 4-4-2 formation, and both created an early chance  but then the game settled down with neither side having a creative edge, and generally losing the ball with long wild passes. In the 21st minute, a Toronto long pass found its target  forward Chad Barrett  but he lost the ball when trying to cut inside a defender. It was another 13 minutes before we saw another attempt at goal, this time Dwayne de Rosario, one of the Canadians on view turned and shot over from around 25 yards. Three minutes before the break, we had a move worthy of mentioning, with a short cross cut in by De Rosario, from which Jacob Petersen hit the ball into the side netting. Toronto created another chance just from an injury time free kick. Those last few minutes indicating they might just have an edge. It was, however, the visitors from Houston that made most impression early in the second half, enjoying possession, but not creating much. Brain Mullen put the ball in the net for them on 57 minutes, but he was clearly offside, and the linesman was quick to rule it out. The crowd finally got something to shout about on 62 minutes, when Joseph Ngwenya squared up to several home players, and then almost everyone else ran in to join the melee, Ngwenya and home player de Guzman were both sent off, while another Toronto player Nana Attakora was cautioned. At least after this, the home side started to play football again, forcing a corner from which Barett shot high over the bar. In the 73rd minute, Houston broke the deadlock when Brian Ching beat his marker and headed in from a corner. 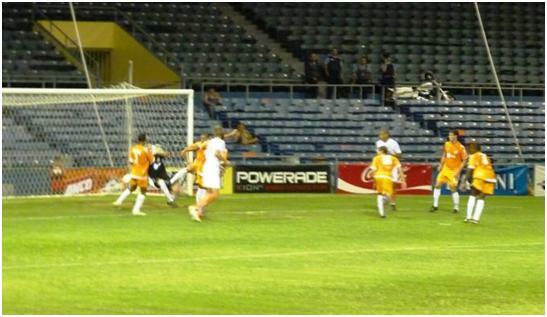 It was almost two within a minute when Lovel Palmer’s shot was saved by the home keeper. Toronto managed a series of attacks, firstly substitute Faud Ibrahim crossed from the left, but into a sea of defenders, one of whom knocked it out for a corner. The corner was cleared, but de Rosario picked up the loose ball, beat a defender and shot from 20 yards, resulting in a fine save from the Houston goalkeeper. Then from this corner the ball was hit deep beyond the far post, where it was met by a firm header by Dan Gargan to level the scores, and finally give the home fans something real to cheer. By and large the fans were still hear as well  as unlike the previous night, there was no large scale exodus nearing the end. Still, all Toronto managed after the equaliser was a series of tame long balls that were as easily defended as those earlier in the game, and a raising of temperatures in the area in injury time, resulting in Toronto’s Amadou Sanyang receiving his second yellow card, and Toronto playing the last 25 seconds with just nine men. Toronto are Canada’s premier football club, but when I looked through the squad lists for the match, I could only identify 7 players of the 36, (6 of the 22 starters) that were listed as born in Canada. I viewed this as not good for football in Canada, but when I asked the local journalists, they found the figure to be encouragingly good, while I thought it was disappointingly poor. Toronto also run an Academy team in the Canadian Soccer League, and their team in that is almost exclusively Canadian  but as I would discover later, the class difference is such that that it will be hard for players to step up. With a crowd given as over 21,000, there were not many seats available. However, the ticket office was open and it was possible to buy. Still, there were plenty of scalpers in action outside the stadium. I did not go as far as finding out whether they were charging a premium for the tickets, and how much over the top prices went. I am told the Toronto FC have sold 16,000 season tickets, a clear demonstration of the current state of the MLS, and particularly some of the newer franchises. Looking around, two things were noticeable about the crowd, especially when comparing to the situation back home in Britain. Firstly, the mix in the crowd  a city like Toronto is extremely cosmopolitan, and yet I saw no signs of racial tension or of ghetto areas. I may have been lucky in this respect, of course. The crowd at the football was also very cosmopolitan, and this must be an advantage to the club over the situation in Britain, where football clubs fail to appeal to racial minorities. The second factor about the crowd was at appeared to have a young average age. I have heard many comments suggesting that the average age of spectators in England is increasing, and more worryingly, the numbers of new young supporters are diminishing. Toronto is a new young franchise, and appears to have an audience to match. The crowd was in god voice, raising their scarves high when the national anthem was sung at the start of the game (and it was sung, the public address just played the first few bars, and then stopped, leaving the crowd to voice the words unaided). A couple of post match notes  quite a few fans hang around after the match. I came across a small group, dancing what I first thought was one of the steel drums, but actually turned out to be a rubbish bin. Still they got a good drumbeat going. When I pointed out this was a drawn match, and ask how they celebrated a win, the answer was “you don’t want to know”. A portion of the crowd were stopping to see a firework display for Canada day, – and yet still an hour after the match finished, there were long and slow queues of cars leaving the parking area. I checked out the stall selling replica shirts, they were selling at C$129.99  just under £90!! And most prices in Canada are quoted without tax, so there may be another 13% on top of this. 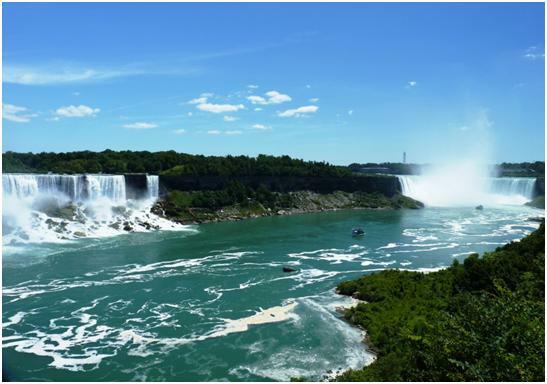 And so onto my last day in Canada  which started with a visit to Niagara Falls. The Falls themselves are as spectacular as may be expected, and are well worth a visit, but the rest of the town is a series of tacky tourist attractions, that I just found unattractive. I am told it is worse on the USA side of the border, but I was not crossing to find out. After the match, I made my way back towards the USA, stopping in London. 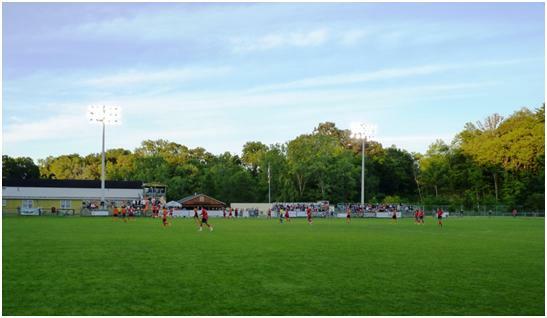 London has two teams, Forest City London, who won the PDL match at Kalamazoo which started my tour, and London City, playing in the Canadian Soccer League. This is the top football league within Canada, although by and large it is restricted to the state of Ontario. Both Montreal and Toronto operate reserve teams in the league, but Trois-Rivieres Attak who are still deeper into Quebec province are taking a year out, despite being defending champions. London City play at the Cove Road Field, which is part of the German-Canadian club in the city. The venue is basic, around most of the playing area you can watch while leaning on a fence, and standing on grass. There are three small seated areas on the entrance side, each with about six rows of wooden seating on a steel framework. Most of the crowd, which I estimated around 150 used the seats. One of the three sections was claimed by about 20 visiting fans, who were singing and making a racket through the game. The admission price was C$10, around £7, while a free programme came in two parts. A season programme, of A5 size running to 24 pages  mainly advertising but including a club history. In addition a single A4 sheet (printed on the same glossy paper as the programme)gave the two squad lists for the match. The match took some time to get going  plenty of enterprise in early exchanges, but most were easily defended. The match turned on the opening goal, which are scored by the visitors, North York Astros in the 35th minute. Mahyar Kohbad, received the ball near the edge of the area, and hit a powerful shot into the top corner. From this point, it always appeared that the Astros were going to win the game, especially as London’s chances, and they had a few, were somewhat softly wasted. Kohbad added the second goal from the penalty spot in the 52nd minute, and a third goal was added with 10 minutes to play. Where does this leave Canadian football. I think it has a problem. The big three are doing well enough, and it can only improve things when all three are in the MLS. There clearly is demand for good quality football when it can be provided. But there is nothing at all between the top three clubs and those who are in either the Canadian Soccer League or the PDL  so great parts of the country are left out. The quality of the Canadian Soccer League is quite poor, it is not capable of grooming players who are going to compete at an international level. It may work as an academy level for Toronto and Montreal, but not as a reserve league. The only person I saw that could make the change in grades was Geoff Gamble, who refereed the game for London City, and was also the fourth official the previous day at Toronto. You are currently browsing the Football Shaped blog archives for July, 2010.